Sanders and Lockheed Martin have a complicated relationship. Bernie helped bring Sandia to UVM, and supports locating the F-35 in Burlington, but he opposes their contracts generally. One is a former Vietnam War resister and community organizer who raises doves in his spare time and now presides over the nation’s greenest and most livable city. The other is the chief technology officer for the world’s largest manufacturer of fighter jets, battleships and nuclear missiles. Together, this unlikely duo takes on the greatest threat yet to humanity’s future: global warming! If the storyline sounds like a satirical comedy, nobody is laughing — certainly not the protesters who came out in force to Monday night’s city council meeting. Nearly all were there to voice their anger, shock and dismay that the Queen City would partner with a corporation that only a week earlier was singled out by U.S. Sen. Bernie Sanders — a former Burlington mayor — as one of the worst perpetrators of criminal fraud against U.S. taxpayers ever. None spoke in favor of the deal. But setting those standards is easier said than done. Burlington has a rich history of antiwar activism, and a long and often conflicted relationship with America’s military-industrial complex — think General Dynamics, which until last fall had called Burlington home for decades. To many who oppose the Burlington-Lockheed deal, this controversy is directly related to the July 2010 announcement by the U.S. Air Force that Burlington had been chosen as one of two “preferred locations” for the new F-35 joint strike fighters, which are designed and built by Lockheed Martin. Though the jets wouldn’t arrive in Burlington for at least seven years, they’ve already sparked significant community opposition, especially among residents of Winooski, Burlington and South Burlington who would be most affected by the increased noise and air pollution. To many observers, Lockheed’s overture to Burlington is seen as a way of clearing the runway for the F-35s’ arrival. The F35s also have their share of local advocates. Their “bedding” in South Burlington would ensure the Air National Guard’s future at Burlington International Airport for decades to come, along with all the associated economic perks. Those benefits include the possibility that some of the F-35 engines could be built at the General Electric plant in Rutland. The GE facility, which employs 970 workers, is part of Vermont’s $2 billion aerospace industry, whose economic impact on Vermont, according to former Lt. Gov. Brian Dubie, is roughly equivalent to that of the state’s dairy industry. Despite Sanders’ recent condemnation of the defense industry in general and Lockheed in particular, Vermont’s congressional delegation welcomed last summer’s F-35 announcement with great enthusiasm. In a joint press release, Sen. Patrick Leahy, Sanders and Rep. Peter Welch all characterized the selection of Burlington for the F-35s as a feather in Vermont’s cap. As Sanders put it, if the F-35s are going to be built and deployed, he’d prefer to see that work done by Vermonters. For their part, Kiss and other city officials who brokered the “letter of cooperation” with Lockheed say that any perceived connection between the F-35s and Burlington’s participation in this so-called “Carbon War Room” project is purely coincidental. Though Lockheed is its biggest benefactor, they argue, other companies are involved, too. They characterize the Carbon War Room as an unprecedented opportunity for the Queen City to join a powerful coalition of visionary and philanthropic companies that are committed to fight global warming. It would provide Burlington with not just the technical know-how to significantly reduce its carbon footprint, but also the financial means to do so. Ultimately, this debate touches on a bigger issue about Burlington’s identity and the corporations with which it chooses to associate: Given the dire predictions about imminent and catastrophic climate change, should the city accept Lockheed Martin’s technical help, and ample dollars, in the interest of achieving the greater good? Or, should Burlington refuse to lend its name and reputation to help burnish the image of the world’s largest maker of weapons of mass destruction? In short, is Lockheed Martin “beating swords into ploughshares,” as Mayor Kiss has characterized it, or engaging in corporate greenwashing at Burlington’s expense? It helps to understand what the Carbon War Room is all about. The aptly named Jennifer Green, who heads the mayor’s sustainability action team, was instrumental in bringing it to the city’s attention and brokering the Lockheed deal. Though Green says she “completely gets” why some people have had a strong negative reaction to Lockheed, she was stunned to hear people calling on the city to “just say no” to the Carbon War Room. Green is an environmental specialist with more than 20 years of experience in community development and environment management with such organizations as the Peace Corps, CARE International, World Resources Institute and World Bank. She says that, despite its bellicose-sounding name, the Carbon War Room actually involves many peace-loving and eco-friendly partners. In January 2010, Green was one of 70 sustainability coordinators working at major cities across North America who received an email from Sadhu Johnston, deputy city manager for the city of Vancouver, B.C. In it, Johnston explained that Sir Richard Branson, founder of the UK’s Virgin Group, was launching a nonprofit called the Carbon War Room. Branson’s goal: to bring together cities that have visionary ideas for reducing their carbon footprint with major financiers who want to make some money while also doing good. The outcome of those communications was the “Green Capital Global Challenge” convention, held in Vancouver last February, which both Kiss and Green attended. The “unfortunate” war-room moniker, Green admits, was chosen by Branson as a tribute to Britain’s experience fighting the Nazis in World War II. Winston Churchill adopted the war-room concept during the bombing of London. For many Britons, it still serves as an enduring reminder of British resolve in the face of adversity. Those players include Jigar Shah, founder of SunEdison, a solar-energy firm; Travis Bradford, founder of Prometheus Institute, a public-policy group dedicated to increasing civic engagement by young people through technological innovation; and José María Figueres, former president of Costa Rica. Kiss points out that María Figueres was a graduate of the U.S. Military Academy at West Point who later went on to disband Costa Rica’s military. It was in Vancouver that the Burlington team first approached representatives from Lockheed’s energy division and offered Burlington as a place to “test-drive” some of the company’s green-energy technologies, which might eventually be deployed in bigger cities. What are Burlington’s specific priorities in working with Lockheed, and how much money will the city reap from that relationship? Kiss says it’s premature to put a dollar figure on it, as no projects have been formalized yet. Nevertheless, the mayor envisions working with Lockheed on a variety of issues related to energy efficiency, such as increasing the fuel efficiency of city-owned vehicles and capturing and reusing steam from the McNeil Generating Station. Perhaps such goals could be accomplished using less controversial, Vermont-based talent, such as the Vermont Energy Investment Corporation and the Gund Institute. But Kiss argues that the Lockheed deal doesn’t preclude forging those other relationships. Kiss says he’s “reserving judgment” on the F-35 issue — until he’s seen the results of an environmental impact study — but he is dismissive of the widely held perception that Lockheed is simply trying to green up its image in order to head off community opposition to the military planes. He calls that theory specious and “too fantastic” to be credible. And, he insists he’s never once discussed the F-35s with anyone at Lockheed Martin. Sen. Sanders’ February 2 press release on the defense industry’s “well-documented history of fraud” references a Pentagon report that singles out Lockheed for 12 violations since 1995 of government contract fraud, for which it paid fines and settlements in excess of $68 million. The Project on Government Oversight, an independent, nonprofit watchdog group, maintains a database of federal contractor misconduct. Lockheed, which gets 84 percent of its revenue from the U.S. government, ranks number one on POGO’s list of corporate offenders. In all, it racked up 54 instances of fraud as well as environmental, ethics and labor violations valued at more than $577 million. Equally troubling is the company’s human rights record, which includes the largest-ever federal settlement in a race-discrimination case. In 2008, Lockheed paid $2.5 million in damages to an African American electrician who was subjected to a racially hostile work environment, including frequent use of the N-word and repeated threats of lynching. Lockheed’s record of abuses could fill a book — and, in fact, it has. Last month, William Hartung, director of the Arms and Security Initiative at the New America Foundation, released Prophets of War: Lockheed Martin and the Making of the Military-Industrial Complex. 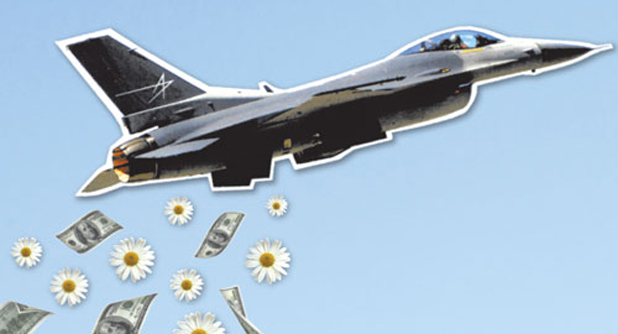 In it, Hartung lays out his case for why Lockheed Martin isn’t just the world’s largest war profiteer but also the most corrupt. Remember the Reagan-era news stories about the Pentagon buying $600 toilet seats and $7000 coffee makers? That was Lockheed Martin. According to Hartung, Lockheed Martin is highly influential in setting U.S. foreign policy and lobbied heavily for the war in Iraq, from which it profited greatly, and saw its stock price soar. The company also makes about $12 million in campaign contributions per election cycle and is currently the single biggest donor to Rep. Howard “Buck” McKeon (R-CA), who now chairs the House Armed Services Committee. More relevant to Vermonters may be Lockheed’s troubled record on the F-35s. The $382 billion program, now the largest project in military aviation history, is already four years behind schedule and has been plagued by technical problems and massive cost overruns. Just last month, U.S. Defense Secretary Robert Gates announced that he’s putting the Marine Corps’ F-35s on a two-year “probation” in order to give Lockheed more time to work out the technical bugs and prove the fighter’s reliability. South Burlington attorney and anti-war activist James Marc Leas says he wasn’t surprised to learn that Lockheed was a major contributor to the Carbon War Room. Leas says he’s seen this kind of greenwashing before — by IBM, in the 1980s, when the company was doing business with apartheid South Africa. Leas, who worked at IBM at the time, recalls how the company launched a charitable project to donate up to $3 million a year in computer equipment — or about 1 percent of IBM’s annual sales in South Africa — to poor black communities in the United States. Leas claims IBM did so in an effort to deflect criticism from its unpopular dealings with a racist regime. He wrote an op-ed about it for the Los Angeles Times. Lockheed has been “diversifying” for some time. In addition to producing planes, submarines and weapon systems, it has also supplied interrogators to the prison at Guantánamo Bay, trained police in Haiti, run the Congo’s postal service and helped write the Afghan constitution. With 135,000 employees worldwide, the company has a business presence in 46 U.S. states. In recent years, Lockheed has also landed contracts to develop biometric ID devices for the FBI, process tax documents for the IRS, scan the mail for the U.S. Postal Service, and process census forms for the U.S. Census Bureau. And, it’s broadened its definition of “homeland security” to include the domestic infrastructure, including protection of the nation’s power grid. Through its work in that area, Lockheed Martin has already made inroads into Vermont. Since 1993, Lockheed Martin has been the private contractor that operates Sandia National Laboratories, which is owned by the U.S. Department of Energy. An outgrowth of World War II’s Manhattan Project, Sandia is one of three DOE labs that still works on nuclear-weapons development. Its sprawling facility is housed at Kirtland Air Force Base in Albuquerque, N.M., and employs about 7500 people. In November 2009, just one month after he lambasted Lockheed Martin on the floor of the U.S. Senate, Sen. Bernie Sanders hosted a delegation from Sandia in Vermont to discuss a partnership with the University of Vermont and local energy companies, with the possible goal of opening a Sandia satellite lab in New England. This wasn’t Sandia’s — or Lockheed’s — first foray into Vermont. For the past three years, Norwich University’s Applied Research Institutes have been working with Sandia researchers on optical engineering and visual-augmentation devices, such as advanced night-vision goggles, for the U.S. military. However, that relationship is a small, “boutique” operation that is worth less than $100,000 per year. By comparison, this recent deal, announced by Sanders in January 2010, is a $900,000 arrangement with Sandia, UVM and Vermont’s energy companies, including Green Mountain Power, to work together on cybersecurity and smart-grid development. The deal is part of a larger, $69 million federal matching grant that Vermont received to modernize and secure its energy infrastructure. John Evans, senior advisor to UVM President Dan Fogel, characterizes the Sandia partnership as “a great opportunity” for Vermont to forge a “long-term relationship” with a major national energy lab. Vermont, he says, could be the first state in the nation with a truly smart energy grid. An exchange of students, faculty and staff between UVM and Sandia is expected to occur as early as this summer. Sanders declined an interview request by Seven Days to talk about Sandia, the F-35s or the Lockheed Martin deal with Burlington. However, he’s made it clear in the past that none of the work Sandia does in Vermont will involve weapons research or development. Don Hancock works on nuclear-waste safety issues at the Southwest Research and Information Center, a nonprofit watchdog group based near Sandia in Albuquerque. As he explains, “Sandia wants to bill itself as the leading national-security entity in the country, if not the world, with ‘national security’ broadly defined. On the UVM campus, the Sandia deal has largely flown under the radar. Last week, the Student Government Association held a lengthy debate on Burlington’s agreement with Lockheed, calling for “full transparency.” No mention was made of Sandia, though that project has been in the news for months. SGA senator and UVM senior Will Bennington notes that in April 2010, the UVM board of trustees adopted a recommendation from the university’s socially responsible investing group to divest itself of any holdings in companies that are involved in the manufacture or distribution of cluster bombs or munitions that contain depleted uranium. Lockheed Martin does both. Burlington, too has tried to legislate responsible corporate behavior. The city has ordinances that require eco-friendly purchasing and livable wages to be paid to its contractors. It also gives preferential status to minority- and women-owned businesses, and prohibits union-busting, discrimination and foreign outsourcing. But those conditions apply only to vendors and contractors doing business with the city, not to entities that partner with the city, sponsor events or donate money. Over the years, Burlington has also adopted resolutions condemning nuclear proliferation, the presence of defense contractors in its public schools and the wars in Iraq and Afghanistan. If the city pursues an ongoing relationship with Lockheed Martin, will future proclamations of Burlington’s values carry the same weight? Before the end of Monday night’s council meeting, Councilor Ed Adrian (D-Ward 1) introduced an amendment to Mulvaney-Stanak’s resolution that would have made the mayor’s letter of cooperation with Lockheed Martin “null and void.” The amendment failed on a 7-7 vote, though the resolution itself, which is nonbinding, was ultimately approved. Greg Guma contributed to this report.